We appreciate you stopping by Toyota of Hackensack. As the most trusted distributor of authorized original equipment manufacturer (OEM) components for Toyota in Hackensack, we are equipped with all of the things required to guarantee your vehicle repair finishes in no time. Taking the dialogue to the subsequent level, connecting with the Toyota components specialists located here at Toyota of Hackensack also means having access to the knowledge and experience of a group of committed and vested professionals at your disposal. From figuring out which part you legitimately need to how best to get this task done right, you can put your trust in the fact that the Toyota of Hackensack crew of parts gurus will be ready to assist you through each phase of this process. Interested in learning more about why buying OEM parts from Toyota of Hackensack is definitely the right call? Then now is a fantastic time to dig even deeper into the benefits of tying in your parts needs with the knowledge served up by the customer service-oriented staff of experts available in the Toyota of Hackensack parts division. Prior to diving headfirst into all of the details regarding why OEM components from Toyota of Hackensack are always your best choice for restorations, it is a good idea to first go over precisely what "OEM" means. In particular, only parts that come from the original manufacturer, Toyota, are worthy of claiming this superlative. While other aftermarket businesses might try and pass off their selections as sharing the same level of quality and commitment to excellence as a legitimate OEM part, the big key here is the OEM part certification is a distinction reserved specifically for components that conform to Toyota's stringent functionality and usefulness standards. A Devotion to Quality Unlike Any Other — Toyota OEM components must undertake stringent scrutiny and assessment before ending up in your automobile, so you should never have any fears regarding the lasting quality and resilience of these replacement items. 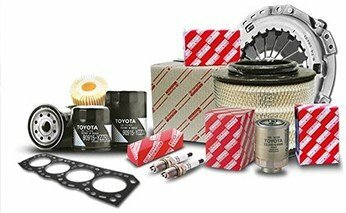 Confirmed to Suit Your Unique Repair Needs — While other parts companies might attempt to take a page from Toyota OEM parts, there is absolutely no way to ignore the reality that only approved OEM parts from Toyota are constructed exclusively with the specs of your car in mind. Crafted by the Men and Women Who Manufactured Your Toyota Vehicle — The same engineers that manufactured the blueprint for your current Toyota automobile are also responsible for the groundwork behind the authorized OEM parts offered here at Toyota of Hackensack, so it makes all the sense in the world to choose to invest in replacement equipment that come directly from this group of certified Toyota engineers. Backed by a Complete Manufacturer's Warranty — Toyota understands confidence in their items goes a long way, so you can be secure in the promise that OEM parts from this automaker come with a customer-first warranty that shields you and your vehicle. To put things plainly, buying OEM parts straight from Toyota of Hackensack is the best way to ensure the undertaking gets done right without any road blocks. Now that you are up to speed with what makes OEM components the best choice, it is time to discuss the final matter on your radar: Does Toyota of Hackensack have the Toyota part I want? Without a doubt, the answer to this question is a big yes! While this is merely a tiny selection of what we have for sale, it is evident Toyota of Hackensack's stock of Toyota OEM parts is second to none. After going over all of the insight showcased here, you are most certainly ready to get the ball rolling toward a successful car restoration and pick up the necessary OEM part for the job at hand. To get you going on the right foot, you have a couple of tracks you can follow. First up, you can plan a trip to the Toyota of Hackensack parts department and have a representative from our professional Toyota parts staff help you sort through all of the particulars of this crucial decision. If Toyota of Hackensack has the item you need on-site, you will be able to take it with you following a brief visit; for anything else, you can rely on us to send your order to Toyota and have the part mailed out as soon as possible. For those individuals who would prefer to utilize online channels, go ahead and look over the OEM parts order form listed below. Right after you do this, a member of the reputable Toyota OEM parts professionals will give this request a thorough inspection and connect with you to confirm you receive the part you are looking for as soon as possible. Thanks again for visiting the Toyota of Hackensack parts page, and we look forward to providing you with access to the best assortment of low-cost Toyota OEM offerings in Hackensack whenever you find yourself dealing with an automotive maintenance venture. Coupon not valid with any other offer or advertised special. Must present at time of purchase. Coupon does not apply to prior purchase.